Konsmo for Congress! Let’s Fix Our State Economy! My name is Mike Konsmo. I live in Powell where I teach at Northwest College. I decided to run for Congress because I want to help students in our state. All across our state, students are graduating from our high schools, our community colleges, and our university, but they can’t find jobs in our state. Now, our education system is facing huge budget cuts across our state. This is because our state economy is failing. It is affecting all our industries and all of our local communities. Everyone is hurting. We need to fix our state economy. Nothing in this election is more important. We need to stabilize the energy resource industries. We need to diversify our state economy. We need to create new jobs from new industries. We need to balance the federal budget and reduce the federal deficit. These are issues worth fighting for! If you believe we need to fix our state economy, vote Konsmo for Congress on August 16! Konsmo for Congress! Let’s Restore Trust! As I have traveled Wyoming, voters have commented that they are looking for a candidate who will restore trust in the political system in our state, so we worked together to create this list of ideas, which will restore trust. A good representative should listen to people in our state! 1. I strongly believe in term limits. I will serve for a maximum of four consecutive two-year terms. 2. I will not accept Congressional health care. I will pay for my own health care out-of-pocket, like many people in our state. 3. I will not participate in the Congressional pension plan. I will save for retirement in my own bank account, like many people in our state. 4. I will not earn any income beyond the Congressional salary. It is enough. My salary will be my only source of income. 5. I will donate 20% of my salary each year to be split evenly between scholarship funds at Wyoming’s seven community colleges and the University of Wyoming. 6. I will not purchase or own any stock in any business while I hold office. I will not participate in any business venture, business ownership, or business investment while I hold office. 7. I will not conduct any fundraising for my re-election campaign committee during the first calendar year I hold office (January 2017 through December 2017). Fundraising for re-election will begin January 2018. 8. I will not accept gifts of any kind while in office. Any gifts will be returned or donated to Wyoming’s seven community colleges and the University of Wyoming under guidance of Congressional regulations. 9. I will hold “office hours” seven days per week in Washington DC and Wyoming. These office hours will be available to constituents via phone, social media, and in person for at least one hour per day, 365 days per year. 10. I will hold a weekly conference phone call with all 23 Republican Party County Chairs in order to stay connected to local communities. I will extend this offer to other parties. 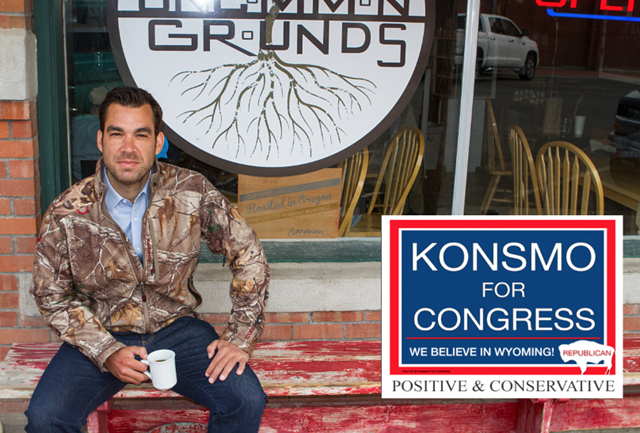 If you believe we need to restore trust, vote Konsmo for Congress on August 16! Sponsored by Konsmo for Congress.